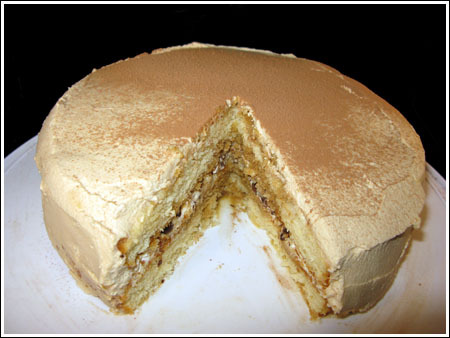 Tiramisu Cake encompasses the flavors of the popular Italian dessert in the form of a layer cake. Preheat the oven to 350 degrees F. Grease and flour two 9×2 inch round cake pans and set them on a baking sheet. Beat the butter on medium speed of an electric mixer until soft and creamy. Add the sugar and beat for another 3 minutes. Add the eggs one by one, and then the yolk, beating for 1 minute after each addition. Beat in the vanilla; Reduce the mixer speed to low and add the dry ingredients alternately with the buttermilk; scrape down the sides of the bowl as needed and mix only until the ingredients disappear into the batter. To make the extract, stir the espresso powder and boiling water together in a small cup until blended. Set aside. To make the syrup, stir the water and sugar together in a small saucepan and bring just to a boil. Pour the syrup into a small heatproof bowl and stir in 1 tablespoon of the espresso extract and the liqueur or brandy; set aside. To make the filling and frosting, put the mascarpone, sugar, vanilla, and liqueur in a large bowl and whisk just until blended and smooth. To assemble the cake: If the tops of the cake layers have crowned, use a long serrated knife and a gentle sawing motion to even them. Place one layer right-side up on a cardboard round or a cake plate protected with strips of wax or parchment paper. Using a pastry brush or a small spoon, soak the layer with about one third of the espresso syrup. Smooth some of the mascarpone cream over the layer - user about 1 1/4 cups - and gently press the chopped chocolate into the filling. Put the second cake layer on the counter and soak the top of it with half the remaining espresso syrup, then turn the layer over and position it, soaked side down, over the filling. Soak the top of the cake with the remaining syrup. Refrigerate the cake for at least 3 hours (or for up to 1 day) before serving - the elements need time to meld.